Knitting: I'm still working on my first colorwork project, my TARDIS mitts! The first one is finished, and though it's a little bigger than I'd like, going down a needle size helped a lot. I'm really happy with how my improvised thumb gusset turned out, too. I was hoping to finish these before I started on my Christmas gift knitting, but that yarn is supposed to arrive tomorrow...so the mitts might have to get set aside for a few weeks. They look great! My colorwork is coming out larger than I would like too. I'm hoping I can shrink it down a bit in the dryer. Looking forward to seeing how your mitts progress. Thanks! I won't be able to put mine in the dryer, but I am looking forward to seeing how the stitches even out when I block them (hopefully!). 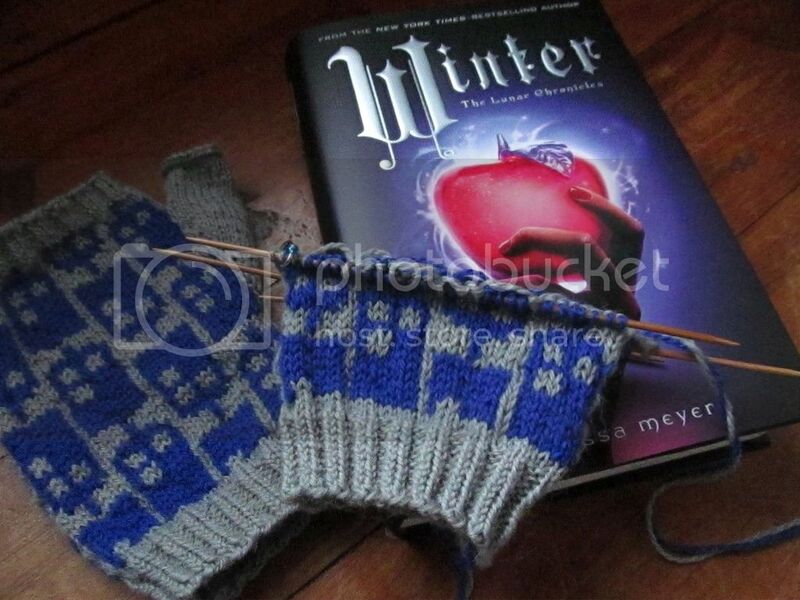 My hubby would love the Tardis mitts...I am not great with colorwork. It is something I need a lot of time and concentration for. Someday! I'm not great with colorwork, either! I can't knit continental for the life of me, so I do a lot of awkward fumbling when I'm using two colors, ha. Those are so cute! I'm going to have to give knitting those a try! These are so different. Love the colours and pattern. Cute mitts! Those books completely sound up my alley so thanks for the recommendation- I'll head to the library site to research! I hope you enjoy the series if you read them! They're so addictive and much better than I expected them to be. :) I love the clever ways that the author incorporates fairy tales into the futuristic, space setting. Thanks! There are so many cute Doctor Who themed patterns out there. :) I seem to find myself knitting something DW related at least once a year! I definitely get a DW vibe with this series sometimes, particularly with Cress and Winter. Thorne reminds me of Jack Harkness, except much better. :) And there's a part of Cress that reminds me of the episode "Asylum of the Daleks."